Hawaii, Collection, 1861-99, arranged and identified on homemade pages; starting with Scott #9a and later re-issue, reprints and specimens, Numerals with #24 & 26, 1869 Kamehameha re-issues, reproduction and reprints present with specimens, completion in Banknotes mint including 1893 overprints with better and multiples, officials complete mint and a nice selection of used with some good cancels, 2¢ rose flying goose flaw, etc., stationery cut squares including blue insides, etc. Hawaii, Collection, 1864-99, beautiful 2 volume collection in Lindner album on Lindner hingeless pages; stamps (nearly complete 1864-00) and mint stationery, Scott catalog over $6,000 + 10-15 covers and used stationery (some nice combinations); generally very nice condition but also the previous owner's layout with special photo's is absolutely gorgeous, should be seen to be appreciated. Hawaii, 1864-91 Royal Portraits Issues, Balance, balance on exhibit pages, unused and used stamps between Scott Nos. 30 and 52C, some shades and duplication, a few flaws but overall Fine-VF. Scott No. 30//52C; $2,256 Estimate $500 - 750. Hawaii, Collection, old-time mint and used collection on quadrille pages featuring Hawaii mint #34, 49, 63, 73 and #66 imprint blocks of 25 n.h. (2), etc, generally Fine to Very Fine. Hawaii, Mint Blocks, 1864-1899, group of 27 mint blocks including #30 nh, #31 og, #32 og, #34 no gum block, #35 nh corner block, #37 nh block, #38 n.h. block, #39 nh, #53 og, #58 og, #59 og. #61 og, #62 og, etc., F.-V.F. Hawaii, Cover Balance, 1869-1900, of 13 covers; includes two 1869 covers to the mainland with "Hawaiian Steam Service" oval handstamp (missing stamps), few legal size cover with 1893 overprint issues, others with 1894-99 Pictorials including usage to Funchal, Madeira, "Paquetbot" usage and some nice town and corner card items; condition varied, inspect. Hawaii, Collection, 1869-99, on album pages mint including Scott 29-30, 31 (2), 33-7, 51S, 52C, 59-61, 61 block of four (3 n.h.), 62, 67-8, 70, 77-82, used including 47-9 and O1-6, review recommended, owner's Scott $2,000+, condition varies. 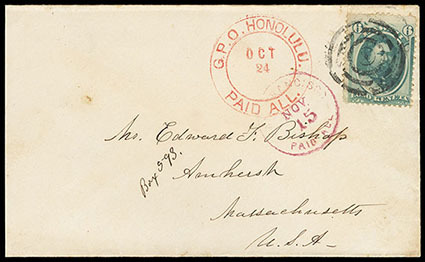 Hawaii, Postal History, group of 22 covers mostly with later period frankings but note #33 used with red "G.P.O. Honolulu Paid All" cds to Amherst Mass., and #55, 57, 62 to Washington D.C.; some mixed condition. Hawaii, Accumulation, 1894-1900, of approximately 1,000 stamps arrange on stockpages, from modest to slightly heavy duplication of Banknote and later Pictorial, includes some high values, etc. ; condition varied, owner's cat $6,000.